The latest study of extreme weather events has concluded that 3 out of 4 heatwaves and extreme heat events and nearly one in five heavy rainfall events, on a global scale, can be attributed to human contributions to global warming through greenhouse gas emissions. As temperatures continue to rise, the percentage is set to increase even further. The researchers looked at 'moderate' extremes, which they defined as events expected to occur on 1 in every 1,000 days under present conditions. It involved examining data on extreme weather events around the globe in a dataset going back more than 100 years, and using two dozen climate models. There has been a growing ability to attribute some single extreme weather events via Fractional Attribution of Risk (FAR) to anthropogenic climate change. Some of the specific individual extreme heatwave and precipitation events that have directly been attributed include the flood risk in England and Wales in autumn 2000 (Pall et al 2013), the European heatwave of 2003 (Stott et al 2004), the 2010 Russian heat wave (Otto et al 2012), and Australia’s record summer temperatures of 2013 (Lewis and Karoly 2013). This study, rather than looking at individual events, examined the change in extreme weather events on a global scale for the statistical attribution to climate change. 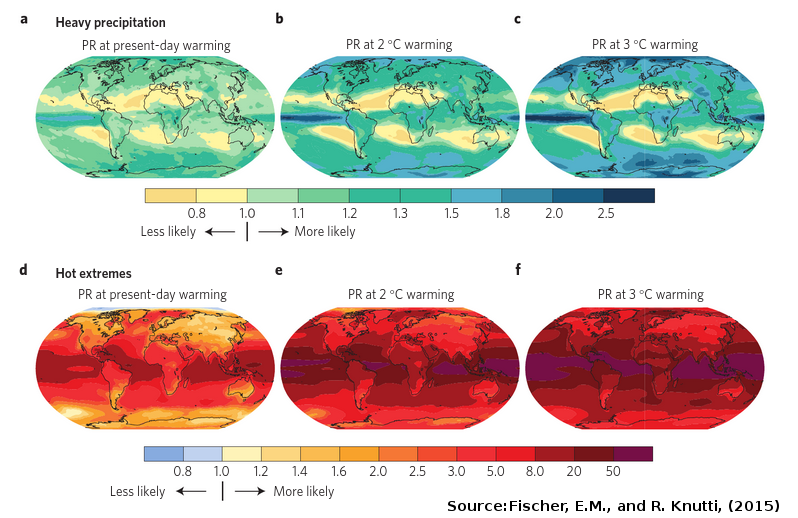 “Climate change doesn’t 'cause' any single weather event in a deterministic sense,” said lead author Erich Fischer, "But a warmer and moister atmosphere does clearly favour more frequent hot and wet extremes." "Already today 75% of the moderate hot extremes and about 18% of the moderate precipitation extremes occurring worldwide are attributable to warming, of which the dominant part is extremely likely to be anthropogenic. The fraction increases nonlinearly with further warming such that the probability of hot extremes at 2C, for example, is double that at 1.5C global warming. With every degree of warming it is the rarest and the most extreme events - and thereby the ones with typically the highest socio-economic impacts - for which the largest fraction is due to human induced greenhouse gas emissions." The earth's atmosphere has warmed globally by about 0.85C since industrialisation. At 2 °C of warming above the pre-industrial level, human-caused climate change would drive 40% of rain and snow extremes and 96% of heat extremes, the researchers found. Climate scientist Michael Mann argued in Scientific American in March, 2015 that Earth Will Cross the Climate Danger Threshold by 2036. That is just in 21 years time. We are already seeing signs of increased storm intensity and extreme rainfall events with Increases in rainfall extremes linked to global warming according to Seth Westra from the University of Adelaide on The Conversation. Extreme heat is by far the largest cause of death from any Australian natural hazard. With rising temperatures heatwaves are are likely to start earlier, last longer, and be more intense. Heatwaves also amplify the urban heat island effect. We need to take steps to adapt our urban environment in response. So what will this mean for our cities? I reviewed the literature on heatwave impact on Melbourne. It means we need to not only escalate emission reduction to reduce the long term increase of temperatures, but we will also need to adapt our urban environment and personal behaviour to adjust to rising temperatures and use water sensitive urban design to prevent or lessen the impact of flash flooding from torrential storms. For developing countries, especially in the tropics and sub-tropics, as more people improve their income, air conditioning will become part of their lives in dealing and adapting to heatwaves and rising temperatures. This will increase energy demand globally. A study released March, 2015 by Lucas W. Davis and Paul J. Gertler - Contribution of air conditioning adoption to future energy use under global warming (abstract) - used high-quality microdata from Mexico to examine the empirical relationship between temperature, income, and air conditioning. "We describe both how electricity consumption increases with temperature given current levels of air conditioning, and how climate and income drive air conditioning adoption decisions. We then combine these estimates with predicted end-of-century temperature changes to forecast future energy consumption. Overall, our results point to air conditioning impacts being considerably larger than previously believed." conclude the authors. The authors model, using conservative assumptions about household income, predicted the near-universal saturation of air conditioning in all warm areas within just a few decades. "Temperature increases contribute to this surge in adoption, but income growth by itself explains most of the increase. What this will mean for electricity consumption and carbon dioxide emissions depends on the pace of technological change. Continued advances in energy efficiency or the development of new cooling technologies could reduce the energy consumption impacts. Similarly, growth in low-carbon electricity generation could mitigate the increases in carbon dioxide emissions. However, the paper illustrates the enormous potential impacts in this sector, highlighting the importance of future research on adaptation and underscoring the urgent need for global action on climate change." say the authors in the study abstract. This paper underscores that solutions to reducing emissions and adapting to climate change will need to occurr prominently in our cities and urban areas in both the developed and developing worlds. Lucas Davis said on his blog about the study, "there are broader adaptations that over a long time period could substantially reduce the need for air conditioning. Previous studies have found that people move away from regions affected by extreme temperature, so migration could mitigate the need for air conditioning. Demand for cooling also depends on how we build our homes and businesses, norms that can evolve over time in response to changes in climate as well as the availability and cost of cooling technologies." The study provides all the more reason to rapidly expand utility scale renewables and solar PV to meet this increase in electricity demand globally. Additionally, air conditioning provides a positive micro-climate feedback by actually increasing urban temperatures by up to 2C dregees. Hence the need to counteract increased air-conditioning with increased use of urban vegetation as part of streetscapes and urban roofs to add shade and evapotranspiration to cool and moderate the urban heat island. Indeed. Even in first world nations we are going to need to adapt our urban areas through increase in urban forestry like Melbourne is doing, and perhaps do such things like France in mandating that all new buildings in commercial areas must either incorporate green roofs or solar panels. Actually, I don't think France got it entirely right. The advantages of green roofs are many including reducing the amount of energy needed to heat a building in winter and cool it in summer, retaining rainwater and reducing stormwater runoff, and favouring increased biodiversity for birdlife and bees to prosper. And solar roofs are pretty cool too! But combine the two gives even greater efficiencies. Combining vegetation green roofs with solar PV together, further increases plant viability by providing shade and increases energy efficiency by cooling the ambient atmospheric temperatures around the panels and the micro-climate around the building. Hui and Chan from the Department of Mechanical Engineering, The University of Hong Kong, found that an integrated approach could generate 8.3 per cent more electricity than just stand alone solar panels. High temperatures, such as in a heatwave, can decrease PV panel efficiency by up to 25 per cent. This is also the time when electricity production is in greatest demand due to air conditioning load. Electricity production and transmission efficiencies also decrease in extreme heat. So improving panel efficiency during those really hot days can make a large difference in electricity output. "Integrating green roofs and solar PV systems can enhance their functions and effectiveness by cooling and shading effects. The results of literature theoretical study, field measurements and case study in Hong Kong indicated a positive influence for this integration. It is found from field measurements that green roof surface and soil temperatures are reduced from the PV panel shading and higher power output of PV panel is achieved from the green roof cooling effect. The findings of year-round building energy simulation using EnergyPlus indicated that the energy consumption for air conditioning of the integrated system is slightly lower than the stand-alone system and the PV system on integrated approach generates 8.3% more electricity than the stand-a-lone option. The extent of the benefits depends on the system design and how to determine the optimum arrangement for a particular building site." We are going to need to change and update our building codes for more efficient buildings, change the structure of our cities by going carbon neutral, design and innovate solutions such as combining Green roof vegetation with solar panels to increase urban mitigation and adaptation. Climate organisations like the Climate Institute (submission) and the activist Climate Action Moreland (submission) are calling for even higher climate targets as our fair share. Christine Milne, as leader of the Greens, called for the adoption of ambitious post-2020 pollution reduction targets of 40-50 per cent by 2025 and 60-80 per cent by 2030, with a trajectory to reach net-zero pollution by 2040. These are exciting times and we need to make many changes. As Naomi Klein makes clear in this March, 2015 Guardian article everything changes with climate change. John Englart (@takvera) and his teenage daughter Tarryn Clancy (@climateteen) will be travelling to Paris to report on the United Nations COP21 climate talks (including for Nofibs), and in particular what role Australia plays in those negotiations. Over $1400 was successfully raised from 20 backers through crowdfunding to help meet their living costs while covering the climate talks.